Our Tuesday Report will be published biweekly during the months of July and August. We will return to our weekly schedule in September, and wish you an enjoyable summer. World�s Largest Mall Is EMPTY!! A seven-million square-foot mall in China is an unbelievable financial flop. The South China Mall, located in the Pearl River Delta (China�s wealthiest region) opened in 2005 with space for 1,500 stores. Currently 12 are occupied�with a vacancy rate of 99.2%. Eli Broad, retired home builder in California, says this is worse than any recession we've had since World War II and he does not think the housing market will recover for years. He also sees a sharp rise in unemployment. Broad contends that as home sales keep dropping, most of the equity people in the U.S. have built over the last twenty years melts away. As jobs disappear, defaults rise and the matter becomes worse. Amy Swift, is Editor-In-Chief of Ladies Who Launch (www.ladieswholaunch.com), a national women�s organization which helps countless women across the country embark on their own careers and companies through incubator programs. Their national LIVE events and online resources have helped other women launch their own successful business. The Luxury Institute and Camper & Nicholsons International�a yacht broker and charter company�found that new orders for yachts of longer than 130 feet are up 18% in 2008. There were 254 new orders for such yachts last year. The report shows the astounding growth over the past decade for jumbo yachts. In 1997, there were just 241 yachts of 80-feet or more under construction around the world...last year 916 such boats were being built. Interestingly, the biggest constraint to the industry�s growth isn�t the economy...it�s the staffing. The report says about 25,000 crew members are necessary for today�s super-yachts, but only about 15,000 currently work aboard yachts. Shortages of captains and engineers are especially acute. International Monetary Systems (OTCBB:INLM), a worldwide leader in business to business barter services, today announced that vacation resort giant, Club Med, approved a corporate barter agreement for high impact media through NTA Trade...IMS� corporate barter division. Club Med launched its all-inclusive resort concept in 1950. It seeks to leverage vacation opportunities for media exposure through its newly forged transaction with NTA Trade. For more information visit www.ims.com. This fall at the International Reciprocal Trade Association�s 29th Annual Convention, to be held at the Westgate River Ranch Resort outside Orlando (September 22-24), the organization looks to re-establish the Corporate Barter Council. 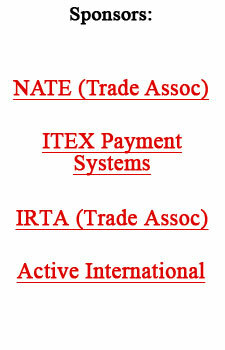 In the early �90s it was a very viable entity for IRTA when excitement about the use of corporate barter was at its zenith. In 1991 at the New York Hilton, some 110 representatives from corporate barter companies met for an electric-like meeting to discuss the future of the industry. Contrary to popular belief, great companies are not born from great ideas alone. We�d all love to think that if we could simply invent the next sticky-note, we could sit back and watch the cash tumble in. But if great ideas don�t spawn great companies, what does? The short answer is: you. The longer, and far more complicated, answer is how you specifically position yourself and your company to execute on an idea. Anyone who overhears your idea, has the same idea at the same time, or basically plans on doing anything similar, is already on the same playing field as you are. In order to differentiate yourself and your idea, you don�t need a patent or some proprietary method. You need a focused plan that allows you to execute above and beyond your competition every day of the week. Think of your competition like your favorite professional sports league. There are dozens of teams which have talented players on them, but only one team is going to perform better than everyone else. Your goal is to build that team. There is a massive chasm between having a great idea and executing flawlessly on a business model for a great idea. Lots of people have great ideas, but very few people ever execute well on them. Execution isn�t just about showing up for work every day and punching a clock. For the team that wins, execution is about going above and beyond the call of duty each and every day. It�s about reaching out to your customer when there are no problems just to see how they are doing. It�s about releasing a product feature faster than your competitor even when you�re already ahead. It�s being the first car in the parking lot in the morning and the last one to leave at night. It�s doing what the guy next to you isn�t willing to do. Even a product that�s a total commodity, like food, can take on an entirely new meaning when you compare the service that comes with it. In your city there may be a hundred places where you can order a filet mignon, but only a handful that are considered top notch. The difference is that the elite restaurants understand that in order to differentiate their product, they need to rely on better service. They pay attention to every detail of your experience, from the greeting you get from the host/ess to whether you�re given a white or black napkin based on your pant color. Exceptional service is by no means a commodity. It�s a rare and unusual thing that very few companies can deliver. Chances are your competition isn�t going to go the extra mile to service the heck out of your customer, which creates an incredibly powerful competitive advantage for you. It�s not uncommon for a startup company to go toe-to-toe with a much larger company offering a very similar product. On its face, it looks like the startup is at a severe disadvantage. Surely the behemoth megacorp can provide better execution and better service with its vast resources than a scrappy little startup can. If you were to try to compete against the behemoth on their own terms you�d get crushed. That�s why startups tend to look for the weak spots in larger companies and exploit them. You can easily differentiate your product from a larger company by focusing on stuff large companies tend to fall short on. Unlike a large company, you can offer the personal service and attention your customers love that they�re probably missing from your bigger competitor. You can leverage your speed by releasing new versions of your product faster and responding to market conditions more quickly. You can offer talented managers founder�s stock, while a big company can only offer another bonus plan. Every weak spot that you can exploit is another way to add value to your idea. Once you�ve identified the points, the more pressure you put on those weak spots, the more value you�ll build for your own product. Outmaneuvering your competition isn�t about doing any one of these things � it�s about doing all of them consistently. If your idea is great and novel, the only guarantee is that it will be copied. If it�s not, you have to wonder how great of an idea it really is. When your idea does get copied, the only thing you�ll be able to rely on is your team and your execution. All of the points about going above and beyond the call of duty, servicing your customer, and exploiting the weak spots will soon be used against you. The only defense against the next up and comer, and the only way to consistently create value around your idea is to stick to fundamental execution. Nothing else has value. Possibly you have become tired of seeing or hearing your company�s advertising messages, and you feel they should be changed more often, or perish the thought, discontinued. 1) Your audience forgets 99% of what they see and hear within two weeks. Why is this? Because in the USA we�re exposed to more than 3,700 advertising and marketing messages daily. And of those, we pay attention to about 85. At best we recall and take action on only 12 of those messages. The marketplace is not stagnant. Because we move, because of better communication, because we get bored, because we want new challenges, because we want to dive into new opportunities, the market changes. When that happens you have to chase it, thus you need to repeat your message. 3) Test new ideas on a continuing basis...and retest old ideas. Your marketplace is like an octopus�never staying in one place for long. You need to find out how to reach it best, and do it in an ongoing manner. 4) Talk to your customers on a regular basis. There is no reason for you to think that your audience remembers what your offer is. Or why they should respond to it. Reach them through multimedia, a combination of mail, phone, broadcast, and hand-outs to keep your message in their minds. 5) You are more likely to be remembered, when it�s time to buy, if your messages are seen frequently.